“Marketing run amok” was responsible for thousands of injuries to DePuy Pinnacle hip implant patients, according to opening statements made in a Northern District of Texas court in September 2014. Helihy-Paoli vs. DePuy marks the first bellwether trial to be heard out of more than 6,000 pending cases in MDL #2244. Johnson & Johnson stopped selling the metal-on-metal hip implants in August 2013, but not before thousands of complications caused by cobalt and chromium leaching out into the bloodstream. “They didn’t tell people they were basically guinea pigs,” the plaintiff’s lawyer told the jurors and U.S. District Judge Ed Kinkeade. As of September 15th, 6,349 cases were part of MDL 2244, a nationwide collection of similar cases against Johnson & Johnson, pertaining to the DePuy Pinnacle hip replacement. The results of this case and the other bellwether trials are expected to affect possible settlements for thousands of other plaintiffs. The plaintiff in the DePuy hip lawsuit is 58-year-old graphic designer Kathleen Herlihy-Paoli of Missoula, Montana. She received her DePuy Pinnacle hip replacements in 2009 and had them removed in 2011. The plaintiff has had five replacement surgeries on both hips to improve pain and restore function after alleged complications and infections caused by the metal-on-metal implant. Tests prior to hip implant removal surgery showed “dangerous levels of cobalt and chromium in her bloodstream” – 85 times higher than normal, according to court filings. Her lawyer said that the defendants ignored data suggesting their product suffered from design flaws and instead assured doctors that the devices worked “99.9 percent of the time.” Internal DePuy researchers knew the design couldn’t meet the company’s own safety standards, but the company “just didn’t tell anybody,” argued Herlihy-Paoli’s lawyer. By contrast, J&J’s lawyer argued that the woman’s issues were related to the surgical positioning of the hip implants in her body, rather than inherent design flaws. The “exaggerated” complaint about the DePuy Pinnacle’s marketing was nothing more than a “smokescreen” designed “to make you mad,” he told jurors. The metal hips had been “thoroughly tested” and “closely monitored” for design defects, J&J said in a statement released prior to the start of the DePuy Pinnacle hip trial. The suggestion that the world’s largest health-care company put profit over patient safety was “utter and complete nonsense,” defense counsel said. Patients with the Pinnacle hip implant reported many of the same side effects as those with ASR implants, including: swelling, pain, limited mobility, and dislocation. The most serious cases involved metallosis, where pieces of metal got into the bloodstream, causing cardiovascular, neurological, renal and thyroid failures. 2005: The Pinnacle hip system was introduced to the U.S. market as a durable implant for young, active patients. They claimed it would last about 20 years and provide greater range of motion that existing products. 2010: The plastic-on-metal ASR hip system is recalled, but J&J continues to sell the all-metal Pinnacle model. May 2011: Multidistrict litigation (MDL 2244) was established to consolidate thousands of similar complaints against J&J. At the same time, the FDA ordered device makers to conduct follow-up studies to better understand the performance of J&J’s metal-on-metal hip implants. August 2013: The device was voluntarily removed from the market following the FDA’s request to submit new versions of the artificial hips for pre-market approval. Why have a bellwether trial? Bellwether trials are helpful to the legal process because they avoid duplicative discovery and streamline proceedings in cases where the facts are similar. The handpicked early trials are designed to expose the strengths and weaknesses of each side. From there, a massive lawsuit settlement may be discussed, the cases can be dismissed entirely for lack of evidence, or the individual lawsuits may be remanded back to state courts for hearings. In addition to the current bellwether trial, other trials are scheduled to begin November 3rd. 2014 and January 12th, 2015. Johnson & Johnson is no stranger to large-scale court proceedings for its orthopedic devices. Last year, J&J offered to settle $2.5 billion in claims for their ASR hip implants. They had announced an ASR hip recall of 93,000 devices worldwide in August of 2010 after it was discovered that 12 percent of the devices failed within five years. They agreed to pay about $250,000 per surgery and cover medical costs for about 8,000 U.S. lawsuits. The total cost of lawsuit settlement is expected to reach closer to $4 billion, according to Bloomberg News. 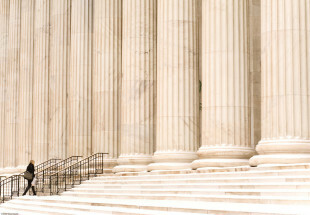 What does this trial mean for other DePuy plaintiffs? DePuy hip lawyers across the country continue to review cases of individuals who believe they have suffered undue harm from a DePuy hip replacement.